At high frequencies, a loudspeaker radiates sound directly forwards. At low frequencies, the sound "leaks" around the sides and rear of the enclosure, and becomes omnidirectional. This transition manifests itself as a loss of output on the forward axis at low frequencies, and in an anechoic chamber the loss is 6dB, or a halving of SPL. With a spherical enclosure the transition approximates a gentle first order step, with its centre at a frequency f3 which is related to the baffle dimensions (Olson, 1969), but with most speaker boxes diffraction from the edges of the baffle tends to add wiggles to the response which can be as large as the step. In a system which uses drivers in a modest-sized enclosure, when the drivers themselves are optimised for flat response in a significantly larger baffle, there will therefore be a low frequency loss in the the axial response. Unless compensation is applied for the baffle step, the speakers will sound subjectively thin. By the way, the step is typically at rather higher frequency than those where "room gain" can be used. John Murphy has an excellent article on the baffle step on his site. 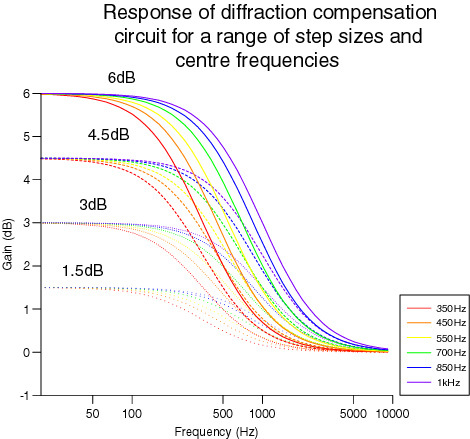 John's approach is based on Harry Olson's work on diffraction from free-standing enclosures of various shapes and sizes, and models the diffraction loss as a first-order 6dB step, which is 3dB down from the low-frequency asymptote at some frequency fb, related to the baffle size by fb=115/Wb, where Wb is the baffle dimension in metres. The 6dB transition theory assumes that all of the energy that is not beamed into the forward half-space is lost for ever, where common sense tells me that a large part of it will be reflected back from the rear and side walls of a normal listening room. An alternative solution is to compensate for half the subjective low frequency loss, or 3dB. Some speakers are designed for "boundary reinforcement" - in other words, they are meant to be used right against the wall. These include the Naim Audio range and some of Linn's speakers, and don't take the baffle step into account. Many others are intended for placement well away from the walls, and so have at least partial compensation for the loss of rear radiation. Most commercial loudspeakers are placed within a metre or two from the rear wall, so that the effective low-frequency loss is less than 6dB; some thoughtful designers use a mid-bass driver with a response which slopes up gently with rising frequency, so that this response trend partly compensates for a 6dB baffle step compensation and gives an overall axial response which is flat in the room. In general it is almost impossible to engineer in the exact physical working environment that the speaker is to be used (unless you design both the speaker and the listening room at the same time!). For instance, speakers will sound very different with their backs to a brick or stone wall than they will against a stud wall. For a simple two-way with a passive crossover there's not much you can do about the problem, and it's simply a matter of moving the speakers around until you get the sound you like. However, if the speaker is designed from the start to be used with an active crossover we have plenty of flexibility to manipulate the frequency response, and here I describe a practical solution which allows the speaker to be used in a wide range of situations. where w0=2 pi x f0. This is required to compensate for the diffraction loss of a speaker in free space. If C = 116nF (two 47nF and one 22nF in parallel) and f0 = 450Hz (for a 25cm baffle), R1 = R2 = 4311 ohms (4K3 will be perfectly suitable). For other step frequencies simply scale the capacitance so that C = 116nF X 450Hz / f.
This is exactly compensated for by my circuit when A0 = 2, and f3 = f0. Using C = 116nF and f0 = 450Hz, R1 = 8753 ohms and R2 = 3626 ohms. Since it is almost impossible to know exactly what fraction of the diffracted wave will find its way to the listening position, and since the effective baffle dimension is also hard to calculate (particularly for a truncated pyramid sitting on top of a rectangular box), it is useful to be able to experiment with different settings for f0 and Wb.